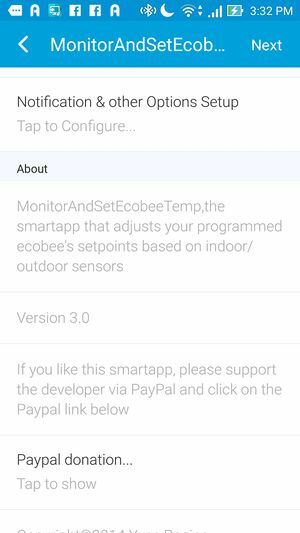 MonitorAndSetEcobeeTemp,the smartapp that adjusts your programmed ecobee's setpoints based on indoor/outdoor sensors. with the ecobee's remote sensor logic. Be aware that the app has been designed to take over your ST thermostat and make automatic adjustments to your setpoints. 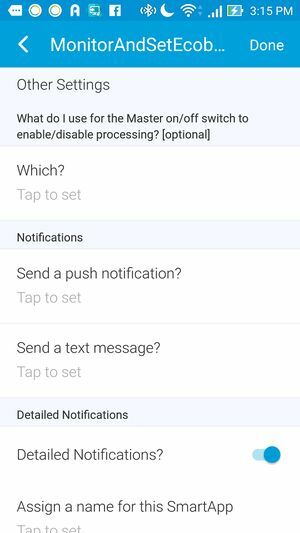 If you make manual changes to your setpoints or use other smartapps/routines, they will likely be overridden at the next app cycle (by default, it's set at 10 minutes). 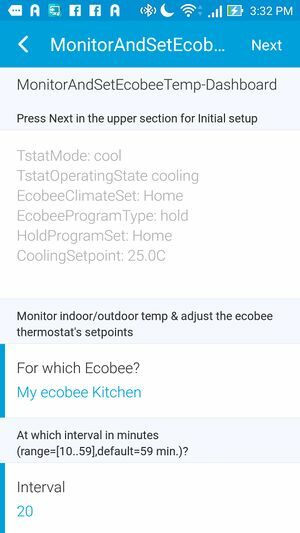 MonitorAndSetEcobeeTemp is a basic version of ecobeeSetZoneWithSchedule. 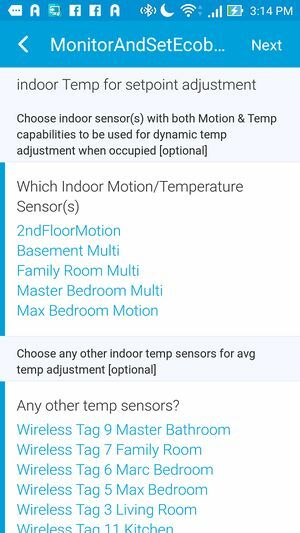 If you want to visualize and have finer control of all your room sensors and how they affect your thermostat's setpoints (along with many other features such as alternative cooling, smart zoning, etc), please contribute to the paid smartapp at my store. Here are some explanations on the setpoints adjustment based on the avg temp calculation method. 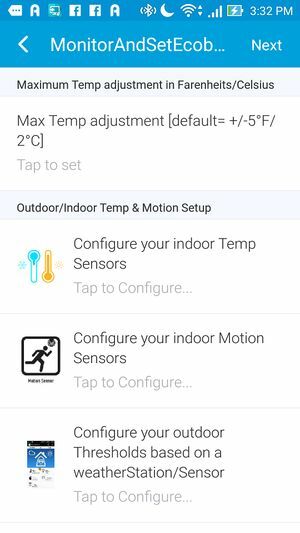 You can always set the max temp adjustment in the smartapp to avoid too large temp adjustment (by default, it is set to 5F). The parameter is called max_temp_adjustment and it overrides any calculation when the calculated temp adjustment is bigger than the max temp adjustment. A temporary hold will be set with the new 77F setpoint. N.B. 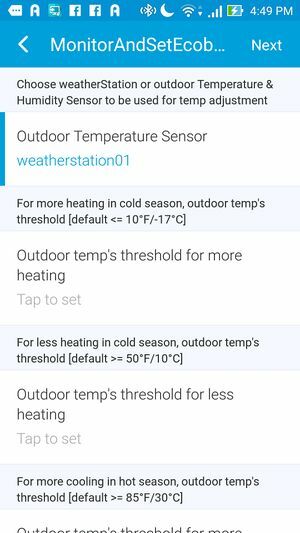 If you set some outdoor temp thresholds, then the outdoor logic may conflict with the avg temp calculation logic based on your indoor temp sensors. The latter will prevail. You then need to save & publish each "edited" smartapp. For the initial setup, under the ST app, click on the Marketspace item in the bottom menu, and then, on the smartapps link and finally, MyApps (last item in the list). If you still do not see your smartapp, please make sure that you have published it in the IDE! For any subsequent execution, under the ST mobile app, click on automations>smartapps in the bottom menu. The list of installed smartapps will then appear. Just update your smartapp by going through all the smartapp setup pages by pressing 'Next' till 'Done'. You can also find the smartapps under the SmartThingsPublic github repo. 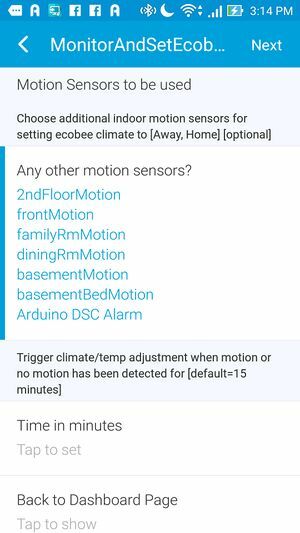 If you have the github integration, you just need to select the ecobee apps that you need when you "Update from Repo" (yracine is at the end of the "New - only from github" list). This page was last edited on 21 October 2018, at 17:40.